Search.mysafesearch.net description might say the search engine can help users protect their privacy, but you should know that the application itself can collect both your private and anonymous information. Therefore, the search tool might appear to be not as trustworthy as users may think it is. 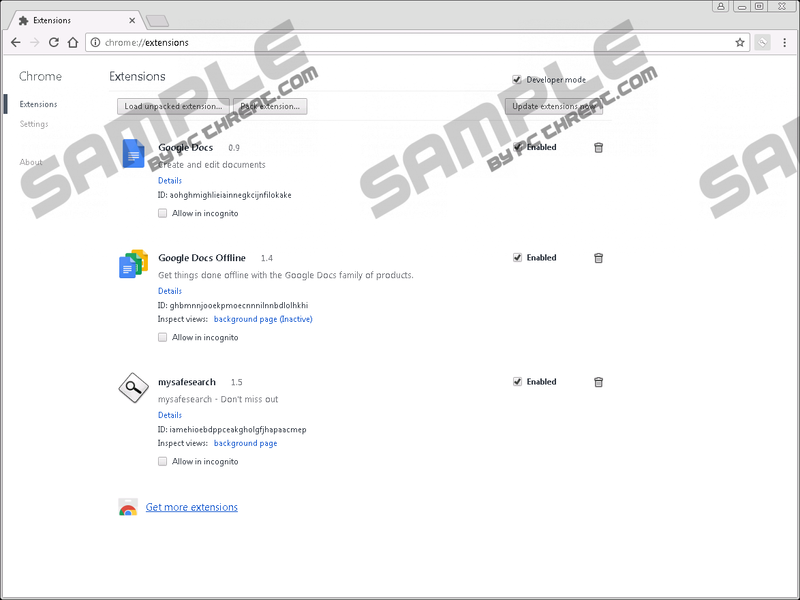 Our researchers found out it travels with a browser hijacker called MySafeSearch. This extension alters user’s default browser settings to replace the homepage, search engine, and new tab page with Search.mysafesearch.net. The worst part is that afterward, it might not only gather information related to you or your browsing but also display questionable advertisements, which could redirect you to dangerous web pages. If you do not want to encounter such content, we advise you to get rid of this doubtful search tool. To eliminate it users should remove the browser hijacker manually as it is shown in the instructions located below this article or with reliable antimalware software. Unfortunately, Search.mysafesearch.net creators “do not warrant, endorse, guarantee or responsible for any third party content or materials.” This means there are no guarantees the application’s displayed third-party ads will be reliable and safe to interact with. For instance, provided advertisements could promote similar threats to the browser hijacker, such as adware, potentially unwanted programs, etc. Some of the advertisements might also redirect you to sites created for malicious reasons, e.g. to distribute malware, steal user’s private data, and so on. Our specialists noticed the third-party advertisements could show up while surfing the Internet with Search.mysafesearch.net. Therefore, to avoid the risk of encountering dangerous ads, we would advise you to replace this search engine with a more trustworthy one. The only way to get rid of this suspicious search tool is to remove the extension related to it. If you want to delete the browser hijacker manually, you should slide a little below and follow the provided instructions as they will guide you through the process. However, if you suspect there could be other suspicious applications on the computer, it might be best to use a trustworthy antimalware tool. Scan your system with it, and the device should detect Search.mysafesearch.net and other possible threats automatically. It is enough to click the deletion button once, and all the threats that could have been identified during the scan should be removed at the same time. Look for folders called iamehioebdppceakgholgfjhapaacmep, right-click them and press Delete. Right-click the listed files separately and press Delete. Right-click files called Preferences, Secure Preferences, and Web Data separately and press Delete to erase them. Quick & tested solution for Search.mysafesearch.net removal.